Introduction: We're hard pressed to think of another form of angling where there are more specialized techniques to catch your prey than when in pursuit of freshwater bass. There's no doubt all the different techniques and all the different gear to support those techniques is part of the allure. 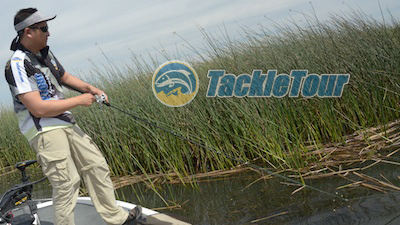 One of the absolute favorite ways for any bass angler to catch thee fish is on topwater. 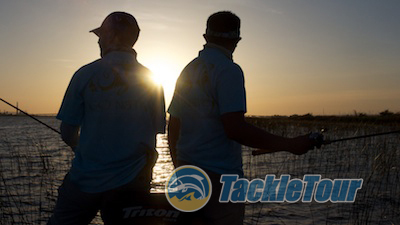 When the sun is low and temperatures are warm, it's time to think topwater! There is no strike more thrilling in all of fishing than the surface strike. Topwater fishing is an adrenaline rush like no other yet with all the different types of topwater baits for bass that are out there, there's only one bait for which we see countless introductions year after year at ICAST, frogs. There is no strike more thrilling in all of fishing than the surface strike. The trouble with frog fishing as with most other topwater techniques is, it's not necessarily an all conditions type of technique. In fact, it's quite the contrary. Certainly if the fish are in the mood to strike a topwater bait, you can catch them on a frog bait in open water, but real attraction of this technique is tossing your bait into cover or on top of matted vegetation and having that fish explode out of that mess onto your bait to tighten your line and stress your rod and reel. But in order for that to happen on a consistent basis, it needs to be hot, and not just seven inches from the mid-day sun hot, but triple digits hot. 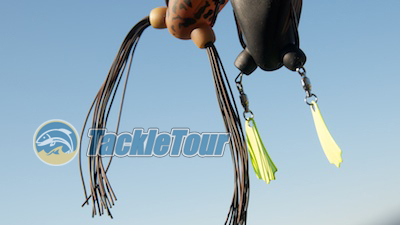 Given the choice, most bass fisherman probably choose a hollow bodied frog as their #1 topwater bait. 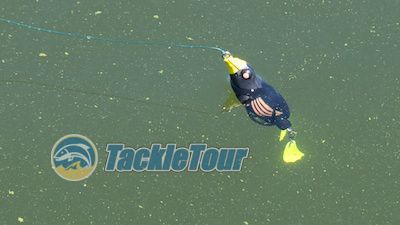 Well, this week promises to be a hot one at TackleTour because it's frog week! We have a collection of frog like baits that we're going to set free and share with you. To make it a bit easier, we've broken down our collection of frogs into four categories. First up is our collection of standard hollow bodied frog baits. 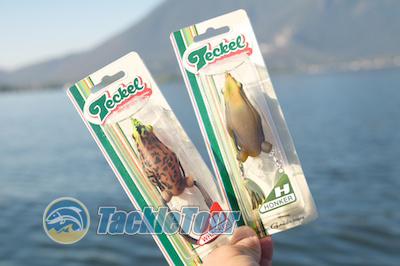 Teckel: A pair of new players to the topwater frog scene this year are products by an equally new bait company, Teckel. 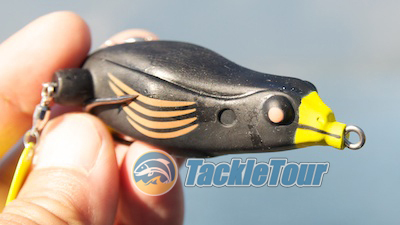 The Whacker is a traditional hollow bodied frog bait, and the Honker is a bait that looks traditional, but features two metal blades as feet instead of the typical skirt material. 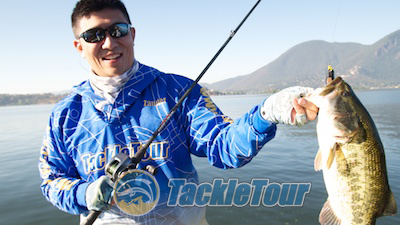 Complete details on this bait are still trickling in as Japanese creator and owner, Hideki Maeda, is working to distribute the baits in North America. Action: The majority of our commentary is going to revolve around the more unique Honker. The Whacker really is a traditional frog bait and the comments we make about the Honker, save for it's floating position in the water, also apply to its fraternal twin. 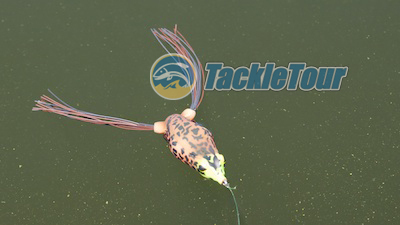 Teckels two hollow bodied frog baits share the same body design. The intriguing characteristic of the Honker, of course, are those bladed legs. The legs are attached to the main body of the bait with bearing swivels and when you retrieve the bait straight across the top of the water, these blades rotate counter to one another creating a lot of commotion from their splashing but also a lot of noise from their crashing into one another. But as you can see, their legs are very different. If you let the bait rest after the cast and twitch your rod tip trying to make the bait walk, the nose moves from side to side and the bladed legs slap at the water. In this retrieve, the bait doesn't mimic a frog so much as a baby bird haven fallen in the water trying to get itself out! The Whacker is a standard frog that lays flat on the surface of the water. Weedlessness: The other great thing about this bait is in both configurations it slides over the top of weeds and back out trough holes and pockets very easily. I anticipated having trouble with the blades in vegetation inundated with hair algae but experienced no real problems. The Honker, on the other hand, is weighed down by it's counter rotating legs and sits nose up. 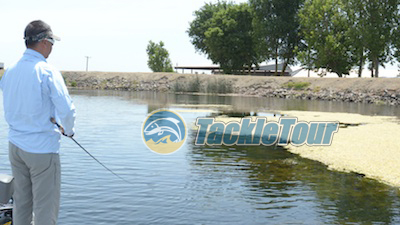 Taking on Water: Water intake on the Honker is slightly more frequent than with the Whacker. This is probably due to the Honker's steeper resting angle in the water making it more susceptible to infiltration. As with any other frogs with this issue, you just need to be aware and squeeze out your bait between every few casts. 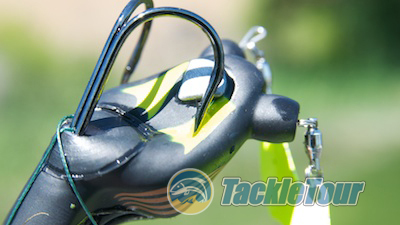 But as with any frog bait, you have to be wary of fouling the bait on hookset. Could the weight of the Honker's legs have contributed to this missed opportunity? Hookup Ratio: We only had one day on the water with this bait in preparation for our week of covering frog baits, but from that limited bit of experience we'd say hook up ratio is a bit better with the Whacker than it is the Honker. The blades on the back of the Honker give the bait a different center of gravity. This weight distribution seems to put more torque on the body and on a couple of strikes, I missed a hook up because the hook points got stuck on the body of the bait. On a few occasions, the bait came back to me like this even without a fish strike. I had no such problems with the Whacker. Zander once again, snipes one of Cal's baits and shows off the results. Availability: Teckel has just started distribution within North America. The only place we know for sure you can acquire these baits is at TackleWarehouse. The Honker is listed at $10.49 while the Whacker is listed at $9.49.